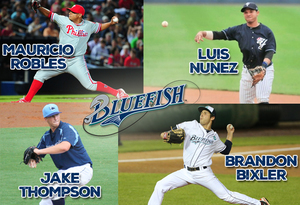 (Bridgeport, Conn., April 5, 2016) – The Bridgeport Bluefish today announced the signings of pitchers Mauricio Robles, Jake Thompson and Brandon Bixler, and infielder Luis Nunez. Mauricio Robles joins the Bluefish for his ninth season of professional baseball and first in the Atlantic League. He last pitched in 2013 when he was a part of the Philadelphia Phillies organization, spending most of the season with Triple-A Lehigh Valley and making a brief appearance in the Major Leagues. He pitched in three games for the Phillies, striking out six batters and finishing with a 1.93 ERA in 4.2 innings. The southpaw began his professional career in 2006 after being signed by the Detroit Tigers as an undrafted free agent. He spent four years with the Tigers organization before joining the Seattle Mariners in 2009, where he played the next three seasons. In 2013, he was acquired by the Philadelphia Phillies organization where he eventually made his way up to the big leagues. In 207 career minor league appearances (97 starts), the 27-year-old owns 36 wins with a 4.29 ERA and 636 strikeouts in 610.0 innings pitched. Jake Thompson comes to Bridgeport for his sixth season of professional baseball and first in the Atlantic League. The right-hander last played in 2014 with Triple-A Durham of the International League and Double-A Montgomery of the Southern League, both affiliates of the Tampa Bay Rays. He appeared in a combined 34 games, collecting five victories with a 2.79 ERA and 44 strikeouts in 51.2 innings pitched. The 26-year-old made his professional debut in 2010 after being drafted by Tampa Bay in the second round of the MLB draft. He has spent his entire career with the Rays organization, reaching as high as the Triple-A level in 2014. In 120 career minor league appearances (83 starts), Thompson owns a 32-31 record with a 3.76 ERA and 330 strikeouts in 490.2 innings of work. Brandon Bixler returns to Bridgeport for his second season in the Atlantic League and fourth of professional baseball. Last year with the Bluefish, the left-hander made eight appearances (five starts), collecting a 4.25 ERA with 24 strikeouts in 29.2 innings pitched. The 24-year-old made his professional debut in 2013 after he was selected by Minnesota in the 16th round of the MLB draft. He spent three years within the Twins organization, starting in Rookie ball for Elizabethton of the Appalachian League. Bixler then moved to Single-A with Cedar Rapids for the 2014 season and the start of his 2015 campaign. In 70 career minor league games, Brandon owns a 10-9 record with a 3.25 ERA and 140 strikeouts in 135.2 innings of work. Luis Nunez joins the Bluefish for his 11th season of professional baseball and first in the Atlantic League. He last played in 2014 with the Lincoln Saltdogs of the independent American Association, where he finished the season with a .320 batting average with eight home runs, 30 RBI, 46 runs scored, and 10 stolen bases in 61 games. The 29-year-old began his professional career in 2005 after being signed by the New York Yankees as an undrafted free agent. He spent seven campaigns with the Yankees organization, reaching the Triple-A level in both 2008 and 2009. The infielder played for Chattanooga (Double-A, Los Angeles Dodgers) of the Southern League in 2012 and in 2013 he spent time with Mississippi (Double-A, Atlanta), also of the Southern League, as well as Gwinnett (Triple-A, Atlanta) of the International League. In 805 career minor league games, Nunez owns a .256 batting average with 41 home runs, 311 RBI, 350 runs scored, and 82 stolen bases.